Edward Miller manufactured a range of hand lamps from the extremely plain and functional ‘home’ lamp which was primarily made of cheap tin, to elaborately embossed brass lamps, with decorative spelter handles such as these ones. Fashioned on the Miller No. 0 table lamp with the same burner and font size, they have no stem, the base fitting straight onto the underneath of the font, giving them a somewhat ‘squat’ appearance with increased stability. Although not usually used with a shade, some are found with a tripod and 6 inch dome shade. All lamps known come with the various Miller #0 burners available, both bayonet and screw thread. It is my opinion that any lamp with a screw thread burner is post c.1894/5, but just because a lamp is fitted with a bayonet burner does NOT mean that it is pre 1894. 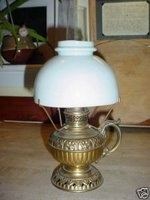 A lamp for ‘after bed’ perhaps kept on the bedside table ready for those ‘little trips’ outside or to the pantry. The ornate example might have been reserved for guests. Photographed are a plain lamp in nickel and a Embossed lamp in brass, both c.1892 and inscribed 'The Miller Lamp Made in USA'. Hieght to top of burner - 6 1/4" Circumfrence of fount (at below rim) 14 1/2"
No. 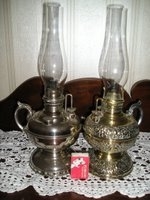 0 hand lamps in the 'Juno' range, c. 1896 are also known but are very scarce. The 'baby' of all Miller lamps would be this one. Designed on the 'Tiny' table lamp this hand lamp is normally found fitted with a embossed flat brass handle which is attached to the base with rivets, although this size of hand lamp with a spelter handle are known. This little lamp is also styled on the same idea as its larger cousins (The No. 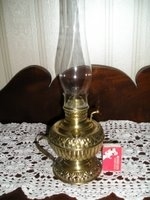 0 Hand lamps) in that it is the same fount and base as the 'Tiny' table lamp but with the stem removed. Available in both nickel and brass, but always embossed. A night light for the child in the 'better' household. 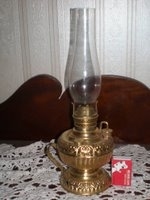 This lamp, with the c. 1892 patent wick raiser is extremely scarce. 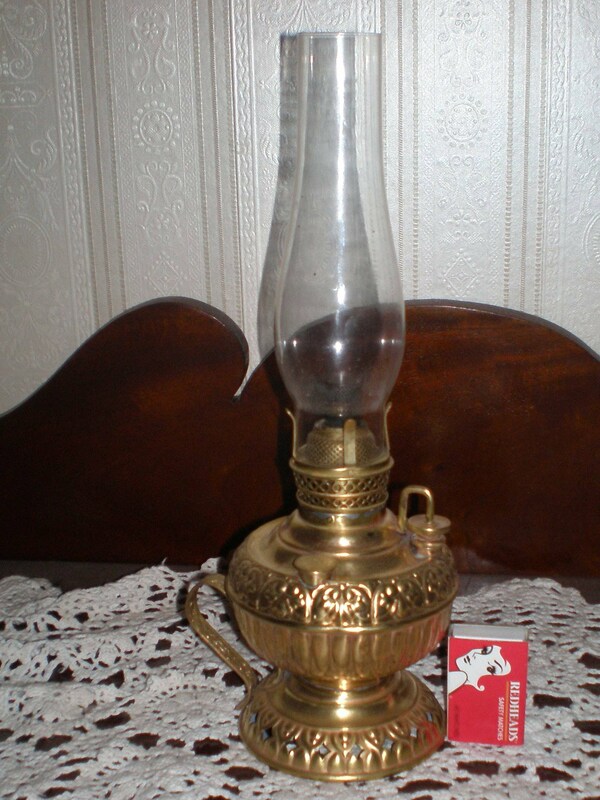 Nearly all of the hand lamps found today are of the 'Juno' type and is inscribed 'The Tiny Miller Made in U.S.A.'. The small handle is made from a strip of embossed brass about 3/8" wide, the pattern of which is often found on Miller's hanging lamps. This lamp is a contradiction of terms and is one of those lamps that needs to be seen to be believed. Although inscribed 'The Tiny Miller Made in the USA' it is in fact fitted with the 'Juno' wick raiser and is thus extremely scarce. Table lamps of this type ('Tiny's') are also known. 'The Tiny Juno Made in U.S.A.' It is fitted with a Juno wick rasier without the guide wheel. The script used in the inscription is similar to that of the 1895 Juno lamps, as opposed to the 1892 versions. Hieght to top of burner - 6 1/4" Circumfrence of fount (at below rim) - 12 1/2"
This example shows a furthur variation in that although a 'Tiny Juno' displays with the larger spelter handle seen on the #0 sized hand lamps. Inscribed 'The Tiny Juno Made in U.S.A.' it is fitted it has the standard Juno features but also an original 6" tripod and shade. In complete contrast to the ‘Tiny’ banquet lamp and Embossed Hand Lamp the ‘Home’ lamp was made with the ‘other end’ of the market in mind. This small hand lamp is as simple as it gets and has been made from the cheapest materials. Fitted with the standard Miller No. 0 burner, the brass on this lamp has been kept to an absolute minimum with the body of the lamp made from galvanized iron. Given that the lamp is of galvanized iron, good examples are hard to come by as they are subject to rust and leaks were common thus causing the lamp to be discarded. 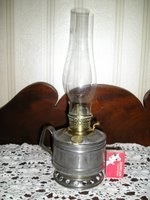 It holds 1 ½ pints (710ml) and will burn for 8 hours and is inscribed 'The Home Lamp Made in U.S.A'. A ‘cheapside’ lamp made for the lower end of the market, true to form and function it would have been kept on the bedside table and used as a night light.